The Corvid is inspired by the Smatchet style combat knife that was used by the OSS and Special Air Service soldiers in Great Britain during WW2. Smatchets were made in relatively small numbers when compared with the earlier 1914 Bolo, which was similar, but only single edged. The Corvid is available with either a “Bone Breaker” rounded spine, or fully sharpened double edges for more experienced folks. This blade may be used effectively for utilitarian and combat purposes, and can serve well as the big knife in any kit. Blade details: 10.25″ Long, 1/4″ thick, symmetrical flat grind. False edge is standard with a fine, smooth spine to serve as an impact surface. 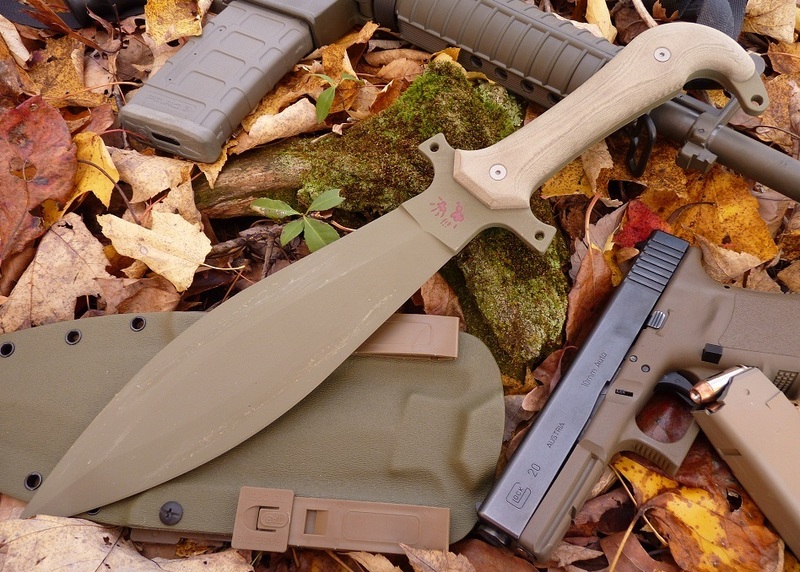 Sheath: Kydex and micarta composite sheath with molle and belt mount capability.